Retreating from Ukraine into northern Bessarabia, German divisions dug in to hold a new final line in front of their most important allies cities and resources. Romanian reinforcements joined them in an attempt to stop the Red Army from completing its spring offensive with a knock-out blow against Romania. Army Group South Ukraine is a supplement for the Panzer Grenadier series of games, with 10 scenarios based on these battles. 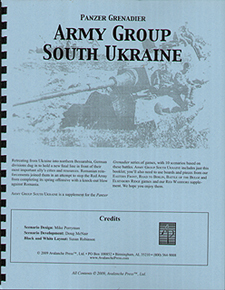 Army Group South Ukraine includes just this booklet; you'll also need to use boards and pieces from our Eastern Front, Road to Berlin, Battle of the Bulge and Elsenborn Ridge games and our Red Warriors supplement.